You turn that second fraction upside down. This is called the reciprocal of the fraction. I will show you a brief video of this process in the video below. The one thing to always remember that when dealing with fractions if given a mixed number turn it into and improper fraction first. As I show in the video example 2 1/3 you would multiply 3 the denominator and 2 the whole number which is 6, then add the numerator 1 which would be 7. The denominator stays the same so it would now be 7/3. The last part that could be a little confusing is when you are given a fraction to be multiplied by a whole number. For example 2/5 divided by 4. This may look confusing to you but, if you remember the this tip. If you add one in the denominator this does not change the number it is still 4, the number simply just turns it into a fraction. Then you go through the process of multiplying by the reciprocal. Multiplying fractions is one of the basic skills anyone who deals with fractions should know. To multiply fractions, you just have to multiply their numerators and the denominators, and then simplify your answer if you can. With a little practice, anyone can multiply fractions like a pro. When dealing with multiplying fractions there are two ways you can do it. The first way I personally like to use is to simplify first then multiply. I feel this works better especially when you start dealing with large fractions, the numbers do not end up being as big. The other option is to multiply first then simplify. Here is a short video I made explaining how to do both methods. One thing to always remember when multiplying fractions is to find the Greatest Common Factor (GCF). The highest number that divides exactly into two or more numbers. When you look at the above sequence you can see there are a couple of common factors, but we are looking for the largest. Which in this case would be four. I thought this was a catchy video with some music kids can relate to. An earlier post my daughter had wanted to learn about perimeter. Therefore, I thought to myself well she would be learning area next so let’s get a jump-start. We took the same table and I asked her to run her hands all over the table as if she was washing it. I told her this is area of the table, which is all the space inside the perimeter. We calculate the area by multiplying length time’s width. The next step I made a grid with the dimensions we had measured before 20×46. The first one I showed her how we could multiply the length 46 by the width 20. Which she told me they have not learned how to do two-digit multiplication yet. So we decided to break in down into something she could figure out in this grid. What we determined first was that 20 was a factor of 100, so I asked her how many twenty’s does it take to make 100. What she did was counted by two’s 2, 4, 6, 8, 10 she said, “five times”. I told her that was only ten though not one hundred and she said “Yes, mom I know but if you and zero’s them you would be counting by 20s: 20, 40, 60, 80, 100.” Now we decided to divide the table into groups of 100 and color each group a different color. We know the width is 20 and 20 x 5 =100 so this is how we determined our columns. She ended up with nine groups of 100, which equals 900 she said and a 1 by 20 strip left so she knew that was 20. She told me her answer was 920 squares. I reminded her in our previous measurements was it in inches, feet or centimeters. She responded, “It was inches” so now try putting that into your answer. She told me then it was 920 square inches. This activity was a bit of a process but I let her guide her way through with the methods she had learned already. I did show her how the multiplication works as well. I told her once she learns the two-digit multiplication the just taking length times width equals area will be much faster. “How to Calculate the Area of a Rectangle.” WikiHow. Web. 25 Nov. 2015. Recently one of my girls asked me how to figure out the perimeter of a square. So this gave me the idea to come up with a few fun activities with her so she could remember and learn how to measure perimeter. I started out by first having her run her finger around the table in front of her a couple times. I asked her if she knew what I was having her do. Her reply “no mom not sure why you’re having me do this” so I told her this is the perimeter of the table. After she figured out, I was teaching her the perimeter of the table by this activity she was ready to learn more. Next, I asked her “Well how can we see how big this table is?” She thought for a minute “Mommy’s tape measure for sewing” so she ran and grabbed one. I let her do the measuring she didn’t want to be in the pictures though. We rounded it to the nearest inch for her to better understand. Her measurements came out to be 46 inches long by 20 inches wide. After measuring, I asked her to run her finger around the edge of the table we just measured again. I then said “What can you tell me about the perimeter of this table?” she told me “Well it is 46 inches long and 20 inches wide”. I said, “Alright how could we determine the perimeter of this table then” and this is what she said “We could add up all the sides “. I gave her a piece of paper to figure it out on her own. She came up with 132 inches. We decided to go around the house and measure different objects such as picture frames, television, microwave, and the bathtub. She came up with the idea of measuring herself. She asked how we could do that. I told her to lay down on our patio. I drew a chalk rectangle around her so she could measure the approximate perimeter of her body. This activity was her favorite. After we were done she was able to remember the exact meaning of perimeter and how the figure it out on her own. This technique was fun, it taught her measurement and perimeter. Not everyone can afford expensive curriculum, whether in your home for your children or in the classroom. We are faced with a lot of budget cuts in the area I live. The school has been faced with many cuts from programs, teachers, curriculum and sports. Why not look to the world wide web to find free resources. There are a lot of on-line based learning programs out there. Lately there has been a lot of children and teachers talking about Khan Academy. So I thought I would personally check this site out to see if this should be used as a learning aid. To my surprise this site is amazing. This free site is for anyone it allows you to set up and customize the learning level of each child. You can track the students progress and change the learning elements. You can set up a class code, so as a teacher you can view the progress each student is making. There is video instruction for the child to view on there own to learn how to do each assignment. After the video you can choose to practice this concept or view the video again. When practicing the concept if you get stuck you can get a hint. While researching the internet for a great site for printing free custom worksheets Education World came in at the top of the list. This website allows you to choose grade level and customize the worksheet. This site also provides a lot of helpful tips and blogs for teachers to utilize. There are so in classroom game ideas for you to choose from which will engage a classroom of fun while learning math. Teaching students by using fraction strip. You can either print these out or have the children make their own. 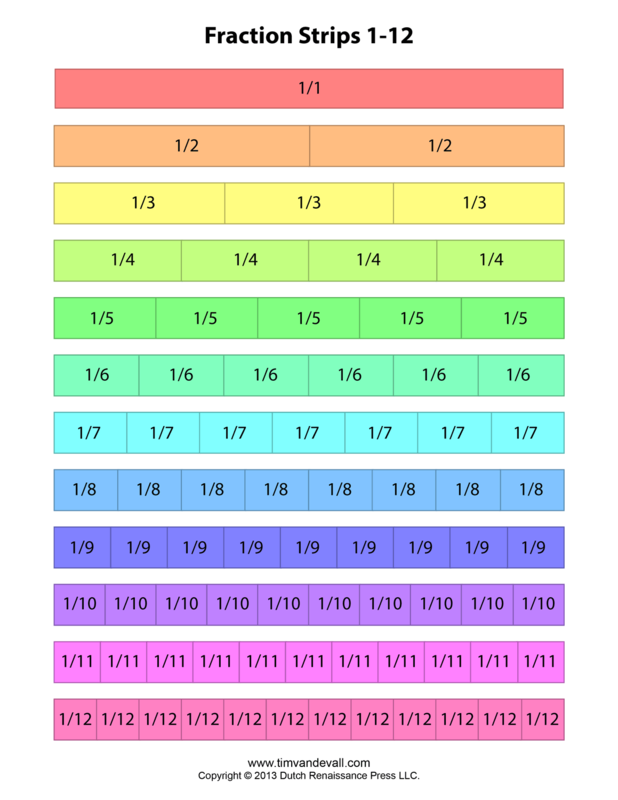 We will start out by filling in the fraction to each strip, so the children begin to familiarize themselves with the concept of a how many of each fractions make a whole. Last off before starting the lesson explain to the students the definition of the word equivalent which means equal in value. understand visually how much each unit fraction is worth. Once the strips are all filled in you will have to students cut the strips apart. Now give a couple of examples of combinations for example of ways to move the strips around to make fractions equal to one-half. Ask the students to move the strips around and see how many equivalent fraction combinations they can make. Ask the children to write down all possibilities of equivalent fractions. After a period of time, call on the students to share some of the equivalent fractions they found. Have them provide an example of their findings. Here is an example of a wonderful video using a smart board as another way to show how to use fraction strips. 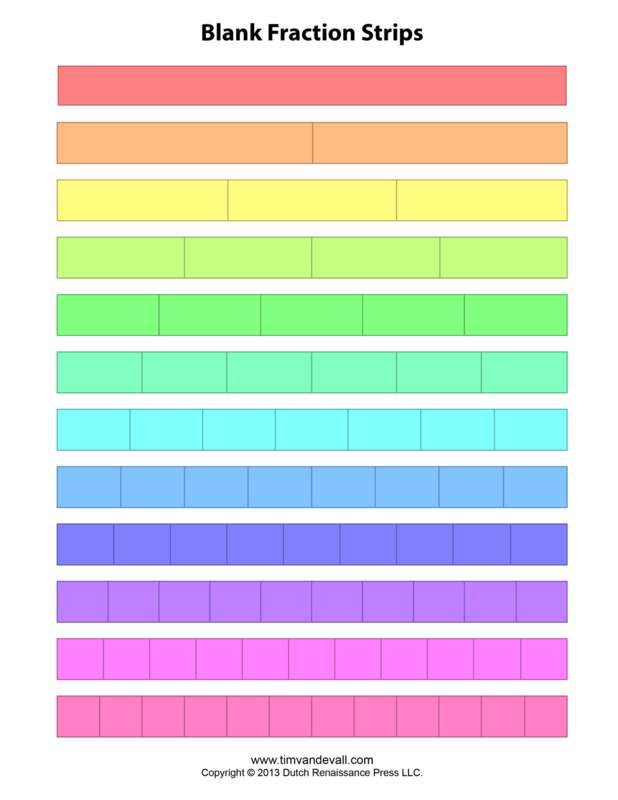 “”Printable Fraction Strips.” Math Salamanders. Web. 11 Nov. 2015. Yahoo.” Yahoo Image Search. Web. 11 Nov. 2015. When children are playing online math games “Are they really learning”? Recently, I have visited a few popular online math game sites. These sites I have witnessed being used by school districts as computer lab math time. They are also listed on the school website as links for education. The first site I visited was cool math games this site contained a variety of games to choose from. The first game I played was Gravitee. There was some strategy involved, it also shows in very small numbers the degree at which you are aiming your shot. There are clues or problem solving steps to teach the student that it you aim at x degrees will accomplish hitting y. It is more of a trial and error theory for the child. The second game I played was Sugar, Sugar, 3. Again, there is strategy to draw lines at certain angles to fill the cup with sugar. You can draw up to three lines in each game play. Nothing but trial and error her for most kids. I played several games on this site, and in my opinion they really are not teaching the kids any real number concepts, or mathematical problem solving skills. Another, site I visited was math games. Now this online math game was a little more promising to teach some math skills. The game I played first was at a first grade level called King of Math. In the game play you have to choose the right answer ex. 10+30, if you get it right the king shoots at a knight. The one thing I did like is you could choose different age levels all the way up to eighth grade. There are several skills to pick from like measuring, time, money and algebra to name a few. I also chose an 8th grade level skills test and it was age appropriate and again was able to view a long list of strategies to teach. So chose your online gaming that will be fun, but actually teaching your students something. Do not rely on the online gaming world as a teaching method to resort to. Use it as a reward occasionally. I feel that some students just go in and press buttons in hope to guess the right answer. Consider playing real math games in the classroom setting instead. You are teaching social skills, visual learning, problem solving, planning and communication with real people. Your students will gain more knowledge from a real teacher! I am married with four children. I live by Leonard, MN. I am currently working on my A.A Degree through Lake Superior College. I plan on attending Bemidji State University next fall in the DLite program. I love fishing, camping and most of all spending time with my family.